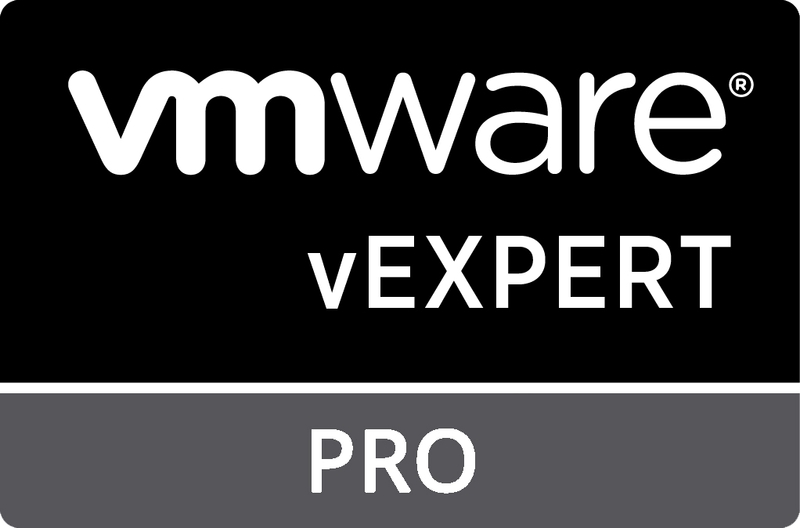 Yesterday, VMware unveiled its vExpert Pro program. For those of you who aren’t aware, VMware runs a program called vExpert. Despite its name, this is not a technical accreditation. Rather, it is an invite-only program (although nominations, and self-nominations are open) and is intended to recognize individuals who give back to the “vCommunity”. The exact criteria for entry are kept confidential, to avoid folks gaming the system. However, for reference, you’ll find that a lot of vExperts regularly blog, present at conferences or user groups, and just generally try to help folks. Along with the title, there are some great perks. Things such as a Pluralsight subscription, NFR license keys, and access to the vExpert party at VMworld. The vExpert Pro program is an offshoot. This is the inaugural year and was invite-only, with no public nominations. Rather, recipients were contacted, given an overview, and extended an invite. I am humbled to say that I was part of the inaugural crowd. Although the vExpert program has been around for 10 years, I only found out about it in 2015 at VMworld. I set a goal for myself to up my game to gain the title for 2016, which I did. Part of that ties into the “why” of the new program. SO WHAT IS A VEXPERT PRO? Similar to the vExpert program, the vExpert Pro program is not a technical accreditation. Rather it is a commitment by the folks in the program to help out others. Helping can come in various forms such as helping out with blogging, providing feedback with presenting, or just helping the person get engaged with the vCommunity in general. The important thing to note here is that it is about getting folks involved. So why did I accept the invitation? I have personally gained so much from the vCommunity. Back before I attended my first VMworld in 2015, if somebody had told me that I would have been a vExpert, a Veeam Vanguard, a Tech Field Delegate, attend HPE Tech Day events, attend an exclusive Camp Rubrik, become a Cisco Champion, or that I would work for VMware … well I have have ran away because clearly the person was insane. But you know what? All of that happened, and that was all from the vCommunity. Giving me the tools, but more importantly, the guidance and confidence to get out there and share knowledge is what set me on this course. Being a part of the vExpert Pro program is my way of giving back. I want to help others achieve whatever they determine as success. BUT THE VEXPERT PROGRAM IS ALREADY TOO BIG! That statement is a hot topic. First off, the vExpert Pro group is made up of existing vExperts, so that isn’t increasing the number. So, does the vExpert program still provide value if the number of vExperts keeps rising? What started off a few hundred folks is now getting close to 2000 strong. When you start getting to numbers that big, what started off as an “exclusive” program might all of a sudden seem to be an all-too-easy to achieve title. But being exclusive was never what the vExpert program was about. Rather it was about building a community. Yes, there are some great benefits that come with the program. Yes, some folks might have “contributed” less to the vCommunity than others. Ultimately, it isn’t our job as members to decide who gets in and who doesn’t – it’s about building a community of like-minded folks. A second role that a vExpert Pro is tasked with is to help identify new, regional vExperts. By and large, the United States makes up the largest chunk of vExperts – close to 40%. Canada on the other hand makes up ~ 2% of the vExperts group. There are 73 countries represented in the vExpert program, and the vast majority of them are smaller than Canada. These are the areas where the vExpert Pro program can really help drive value: identifying users who really deserve the vExpert title in locations that are often overlooked. The VMware vExpert staff team is made up of only a handful of people – they can’t possibly dedicate the time required to do the leg work to find new local vExperts, let alone vet them. Having a small, local, group of of vExperts who can provide insight will hopefully help ease this burden. So what should you do if you are looking to get more involved with the vCommunity? I would suggest contributing. That could be blogging, starting a podcast, getting engaged on social media, or presenting at a VMUG. But if you are looking to get a little help and direction along the way, be sure to reach out to your regional vExpert Pro. I’ve always been honoured when folks have reached out to me in the past for guidance, and I am always more than open to help out if I can. So even if you aren’t in Canada, don’t let that stop you from getting in touch.